Iron Duck Neon Yellow Pro Lite Pro Eco Spinal Immobilization Backboard…Made in the USA! 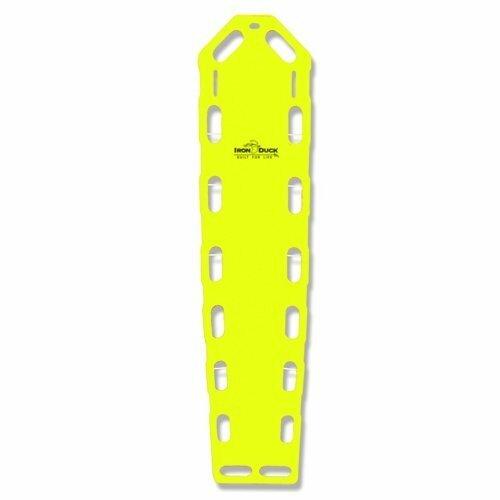 Pro Lite 719-Neon Yellow Pro Eco Spinal Immobilization Backboard. Iron Duck is an American-owned, family business that manufactures Spinal Immobilization Back Boards, Immobilization Products, Trauma Bags, Oxygen Bags, EMS Backpacks, Gear Bags, Midwife Bags, Equipment Bags, In-Flight Medical Kits (IMK), Forward Resuscitative Surgery System (FRSS) Bags and Custom Sewn Products for Emergency Medical Services, Disaster Response, Fire, Military, Government, Security and Law Enforcement markets worldwide. The Military Bags (FRSS) are registered with NSNs (National Stock Numbers) with the Defense Logistics Administration (DLA). Iron Duck manufactures the world’s leading brand of Emergency & Disaster Response Products; designed, manufactured and marketed at our 55,000 square foot facility in Chicopee, Massachusetts and used by Public Safety (Fire, EMS, Police & Security), Medical, Military (U.S., NATO & Others), and Government (CIA, FBI, Homeland Security, etc.) personnel worldwide. We have formed partnerships with end users and industry leaders throughout the globe to develop innovative, superior quality equipment that’s built to make the end user’s job easier, while helping to improve patient care and safety. The Iron Duck brand name was created by combining two materials synonymous with durability: Iron: great strength & hardness and Duck: strong tight weave canvas fabric (Army Duck Cloth). This results in products manufactured with the highest quality materials for solid construction and long life. Iron Duck has a long history of solving problems by providing timely, innovative products to the world’s public safety community. Many of our Emergency Services Products are designed for and used by large municipal agencies such as Fire Department City of New York (FDNY), Chicago Fire, Houston Fire, Philadelphia Fire, and many more. Since 1992, the FDNY has partnered with Iron Duck to develop innovative products that their first responders use every day. To meet the FDNY’s high standards, our products have to be reliable, withstand rigorous daily use, and help crews do their jobs faster and safer. That’s why for over 22 years, Iron Duck products have been on all the rigs of New York’s bravest. Why not yours? Our dedication to use the very best quality raw materials, expert craftsmanship & ingenuity, and superior manufacturing techniques has resulted in incomparably positive results like exceptional functionality, ease of use, and extreme durability in the toughest places on Earth; from the accident scene to the battlefield! Iron Duck recently entered into a partnership with Rapid Deployment Products and we can now offer you two great product lines from one great source! Iron Duck products will provide the best possible solution to any challenges facing you, whatever your task may be! If you have any questions about this product by Iron Duck, contact us by completing and submitting the form below. If you are looking for a specif part number, please include it with your message.